The Modkit team had an eventful weekend! While at the Maker Faire in the Bay area, we launched a Kickstarter campaign for our latest project: Modkit Micro. 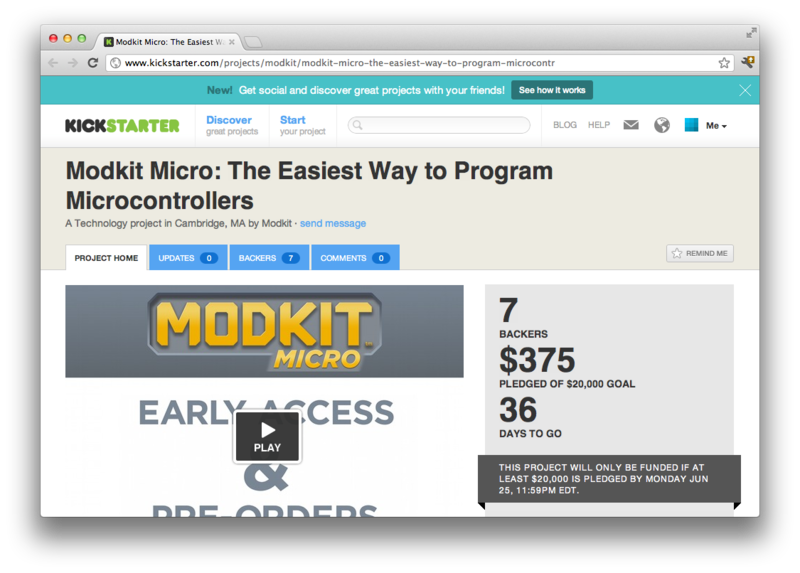 You can find out everything about the project by visiting the Modkit Micro Kickstarter page. We appreciate your ongoing support and hope that you'll back our Modkit Micro work. Your support will help us launch a desktop (offline) version of Modkit Micro. Supporters who contribute more than $25 will get early access (as early as 6/1/12) to the new Modkit Micro online version through a membership to our Alpha Club. Help us keep the momentum going by spreading the word! I work for a university and we'd like to purchase an Alpha account, but cannot do that through kickstarter since it is considered a donation. Is there some other way to purchase? Wow, i just backed the project. The timing for this is perfect for me. My 9 year old son has shown an interest in Arduino, and I was already looking at Scratch to teach him the basics of programming, combining them is perfect. Thanks! Hi, I think my comment didn't come through for some reason. Just wondering if you could explain the difference between this project and the one featured on http://blog.minibloq.org/ ? As a long time squeak/scratch user, I think that ModKit is a great idea. My son (7) is super excited about it. But to be useful, I think that we need some more hardware support. For example, to use an ethernet shield is required to do many interesting things, but it's not clear how to do so within this environment. Can I simply copy/paste in the TCP and ethernet source code? Or are you (I am hoping) planning to add a library of pre-built modules (or modules that we can build) to encapsulate logic into visual widgets? For example, I'd love to have 'send data to pachube' as an action that my apps could perform. A much more trivial request would be to rename inputs/outputs. For example, I have an Arduino sketch that uses a few analog sensors, which as far as I can tell end up as 'knob 1' and so on. Would it be possible to rename them to be more meaningful? For individuals who have not as much as immaculate credit or no credit by any means, a loan is the simplest approach to get cash. In the event that you can't get an advance from a bank, don't sweat it. Loan moneylenders can get you the money you require when you require it most.